AT&T has the One X. Sprint has the EVO 4G LTE. But it's been a long while since Verizon customers had an HTC flagship to call their own. The Droid DNA would very much like to grab that mantel, please. And it's got about every spec a geek could ask for. As we know, specs don't always add up to a great device, but then again, sometimes they do. A big, beautiful phone that runs Android 4.1 (Jelly Bean) with HTC's Sense UI on Verizon's 4G LTE network. People who want a device that really performs—and looks good doing it. The Droid DNA has a whopping 5-inch 1080p screen, but it's slender enough that it doesn't feel nearly that big (it's basically the same width as the Galaxy S III, just a little bit taller). The Gorilla Glass screen curves around to the sides, making the display seem bigger than a phone with this footprint should allow. The back is a curved polycarbonate that's smooth but grippy. The 8PM camera is flush with the back, as are the buttons with the sides. And the DNA opts for three capacitive navigational buttons (Back, Home, and App Switcher) rather than sticking with stock Android's onscreen nav buttons. The user experience is quick and smooth, thanks to the zippy quad-core Snapdragon S4 Pro processor and 2GB of RAM inside. HTC's Sense overlay isn't quite as fast as stock Android on the similarly spec-filled Nexus 4, but it's close enough that you won't notice or care. Even with seven HD games open simultaneously, it was still able to handle Dead Trigger—with the graphic details set to High—without skipping a beat. Text looks terrific on the 440 ppi screen, phone calls sound good, and the camera software is powerful and intuitive. Hardware design. It looks good, but it feels great. It's light, but strong. The curved edges of the screen give you more usable space. The convex back gives a thins the Droid DNA out nicely; it sits comfortably in the palm of your hand, and it slides right into your pocket. You approach the same screen real-estate as the Galaxy Note II (5.5-inch screen), but it's in a much smaller package. For all of HTC Sense's strengths, its keyboard is terrible. Terr-ible. The predictive text and autocorrect are unintelligent, the layout is unintuitive, and it's just generally inaccurate. Blech. The very first thing you're going to want to do with the Droid DNA is download and install a competent third-party keyboard like Swiftkey. You're welcome. The most-hyped feature of this phone is its 5-inch 1080p screen, which gives it an unheard of pixel density of 440 ppi. But an exhaustive screen comparison of the DNA and the competition found that it's really one step forward, one step back. The almost imperceptible gains you get in sharpness aren't worth the hit the phone takes on brightness and color accuracy. That big screen is paired with LTE and a relatively modest 2020 mAh Li-Ion battery, but the Droid DNA still lasted until 10pm every night with moderately heavy usage. It's certainly nowhere near the marathon levels of the Droid RAZR MAXX HD, but it outlasts the Galaxy S III. HTC did something really smart with the front-facing camera: they made it wide-angle. This means you don't have to dislocate your shoulder trying to get the camera far enough away from your face for video chatting or vanity shots. It's a 2MP camera, and actually takes decent enough shots. The Droid DNA supports wireless charging out of the box. We were able to test it with a Nokia wireless charger and it worked great. Just plunk it down on it, and a message pops up on the phone to let you know that it's charging wirelessly. The Nokia one is a lot smaller than the Droid DNA, which makes it a bit unstable, but there's one specifically for the DNA that is sized just right. The phone has two amps in it: one for the headphones (with Beats) and one for the external speaker, which is a cool twist. The Beats enhancements you get from the headphones basically just turn up the volume and up the bass—it's an equalizer trick and that's about it. The external speaker, however, can volume up all the way and it doesn't distort. Sounds pretty good for a phone speaker. Text looks great on this thing. It makes reading emails and longer articles very easy on the eyes. There are three dumb things about the hardware. The volume rocker and the power button are flush to the point where it's hard to feel them. It's a bit like Pin the Tail on the Donkey. And the last dumb thing is the cheap, plastic micro USB port cover. I wanted to tear it off and never look at it again. Rock solid data speeds on Verizon's LTE network. With only three bars our download speeds averaged 16Mbps and upload averaged 9.5Mbps. Unfortunately, you are limited to the 16GB of built-in storage. There is no micro SD card slot and no 32GB option available. No removable battery, either. There's just a small subsection of the population for whom that will be a deal-breaker, but it's worth noting. We've been using the phone as our primary handset since Tuesday. Yes. It's a really nice piece of hardware with tremendous guts and some pretty good software. It's not the best display ever, but it's certainly the best screen on a Verizon phone. It's also handily the fastest phone on Verizon. We would have liked a better camera and longer battery life, but in general, we really like this phone a lot. 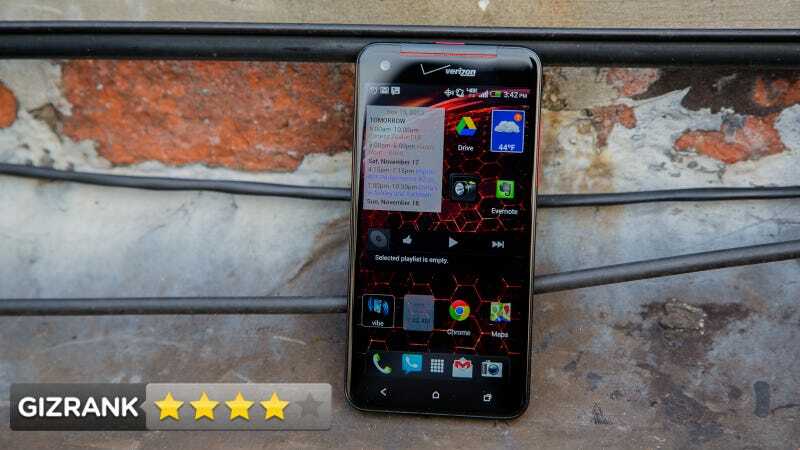 You could make a case for the Droid RAZR MAXX HD based on battery life alone, but in terms of performance, the Droid DNA is Verizon's best phone.